I recently started knitting again. I learned when I was pretty young at 4H. I remember going upstairs at the old high school in Straughn to learn this. It has been years and I never really made anything. When I was pregnant with Mary I tried to knit a blanket but had forgotten all I knew so it all just rolled up onto itself as I progressed using just the basic knit stitch. I am not much better now, and I have ripped this poor piece out at least 6 times so far. It is not very straight or professional but it feels soft and nice and when it is long enough I will be proud to wear it as a scarf. 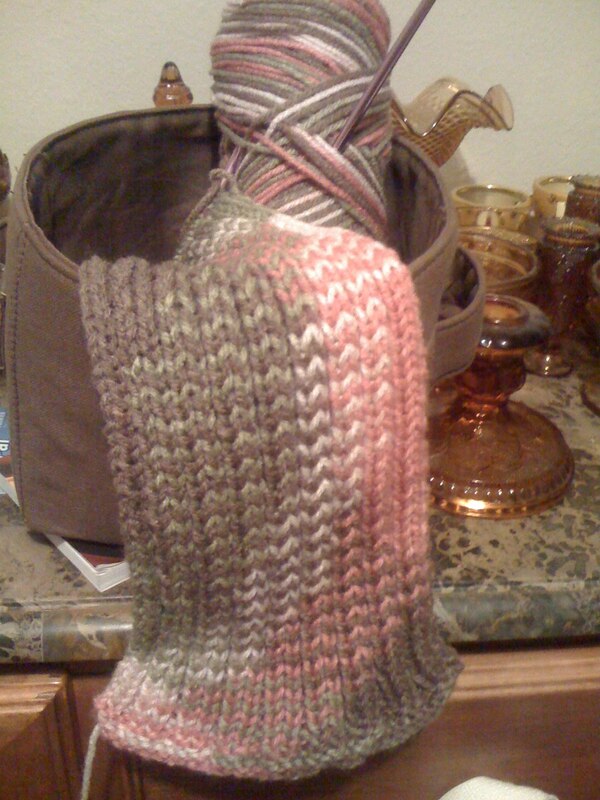 The yarn is prettier than this iPhone photo shows even though it is just something inexpensive from WalMart. Next time I will remember to save the wrapper with the name and numbers on it! I am already itching to try some of the patterns I have seen at Ravelry. One of my oldest and dearest online friends is a moderator on a group there and invited me some time ago. I never really thought of knitting while in Dallas as it is hardly cold long enough for all that work but now that I am spending winters in the Netherlands it is. I already ripped it out Sonya, right after I took that pic! The yarn is too heavy for that stitch I think. I need to find a pattern that I can follow and make something simple and easy that I can finish fast and that will give me confidence to make something else.I did find some Dutch groups on Ravelry, so I am excited about that. Hello there!Merry Christmas to you and your family.I have also recently started knitting again, I think that winter is just so perfect for it! I used to knit a lot when I was younger and I have made all kinds of things: sweaters, cardigans, blankets, baby outfits, worked with colourful patterns and 10 different yards at a time and all that. But it's been a while, I just a simple straight pattern is proving to be a challenge for me now! Anyway, I just wanted to suggest you try using thicker needles for that yarn and also, a different stich, probably – the one down, one up stich makes your knitting lovely but thicker too. Good luck!! Hi Aledys, thank you! I do agree that the yarn needs much thicker needles. I have not had a lot of time over the holidays but things should be back to normal soon.